44 years of experience, deciding cases based on law, justice and common sense, and helping parties resolve their disputes outside of the courtroom. Craig Beles’ experience as a trial attorney, commercial arbitrator, mediator, law professor and legal consultant spans 44 years. Mr. Beles has arbitrated, mediated or litigated over 400 complex disputes involving international contracts, intellectual property, software development, antitrust, telecommunications, securities, transportation, construction, personal injury and employment. He has also presided in over 60 hearings as a Washington State Administrative Law Judge resolving unfair labor and discrimination claims. In addition to his regular ADR practice, Mr. Beles has taught “Transnational Litigation & Arbitration” and “Comparative European International Arbitration” as an Adjunct Professor of Law in Seattle, Washington and as a Fulbright Scholar in the Czech Republic. In 2015, Mr. Beles was named a Fulbright Specialist in International Peace and Conflict Resolution by the U.S. State Department and assisted the Republic of Mauritius in fostering a culture of alternative dispute resolution. “Commercial Arbitrator of the Year” Global Awards by Corporate LiveWire in 2017. “Best For International Contracts” Acquisition International Magazine in 2017. “Most Outstanding Commercial Law Firm” Global Excellence Awards by Corporate Vision Magazine in 2017. Named “Fulbright Specialist Peer Reviewer” by U.S. State Department in 2016. 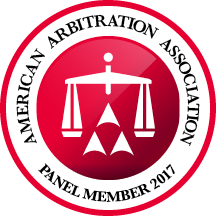 “Best Contract Disputes Arbitrator – USA” Legal Elite Awards by Corporate American Magazine in 2016. “Best Arbitrators & Mediators in Seattle” by Expertise Magazine in 2016. “Best in Transnational Commercial Disputes” Global Excellence Awards by Acquisition International in 2016. Named “Fulbright Specialist in Peace & International Conflict Resolution” by the U.S. State Department assisting the Republic of Mauritius in developing a culture of ADR during the Summer of 2015. “Top Rated Lawyer in ADR” by American Lawyer Media and Martindale-Hubbell in 2015. “Global Award Winner in International Trade,” by Corporate LiveWire in 2015. Named to the National Academy of Distinguished Neutrals (NADN) in December of 2013. “Seattle Top ADR and Mediation Lawyer” by Seattle Metro Magazine in 2010. “Top Ten Lawyers in Washington State” in the field of “Contracts/Agreements” by CEO Magazine in 2008. Named a Fulbright Scholar by the U.S. State Department teaching “International Dispute Resolution” and “Comparative Torts” in the Czech Republic in 2008 – 2010. Rated “10.0 Superb” by Avvo.com every year since 2007. Named Member of the Chartered Institute of Arbitrators of London, England since 2000. Rated “AV-Preeminent” by Martindale-Hubbell every year since 1990. The King County Bar Association and every minority bar association in King County have recognized my judicial temperament and skills as a neutral by rating me “Exceptionally Well Qualified” to sit on the trial court bench. Call Craig Beles at The Beles Group – 206.618.9119 or contact the firm online. Craig C. Beles Arbitrates & Mediates Throughout the USA & Worldwide.